Objective: Single-port trans-umbilical laparoscopy has emerged as an attempt to further enhance cosmetic benefits and reduce morbidity of minimally invasive surgery. 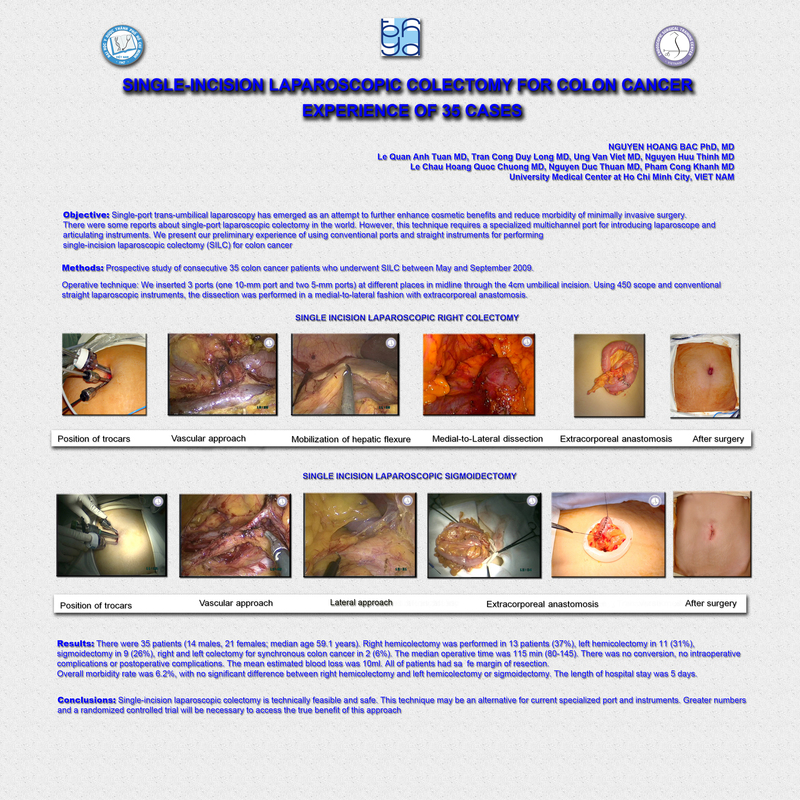 There were some reports about single-port laparoscopic colectomy in the world. However, this technique requires a specialized multichannel port for introducing laparoscope and articulating instruments. We present our preliminary experience of using conventional ports and straight instruments for performing single-incision laparoscopic colectomy (SILC). Methods: We inserted 3 ports (one 10-mm port and two 5-mm ports) at different places in midline through the 4cm umbilical incision. Using 450 scope and conventional straight laparoscopic instruments, the dissection was performed in a medial-to-lateral fashion with extracorporeal anastomosis. This is a prospective study of consecutive 35 colon cancer patients who underwent SILC between May and September 2009. Results: There were 35 patients (16 males, 19 females); median age 59.1 years. Right hemicolectomy was performed in 11 patients (31%), left hemicolectomy in 9 (26%), sigmoidectomy in 12 (34%), right and left colectomy for synchronous colon cancer in 2 (6%), left hemicolectomy and cholecystectomy in 1 (3%). The median operative time was 115 min (80-145). There was no conversion, no intraoperative complications or postoperative complications. The mean estimated blood loss was 10ml. All of patients had safe margin of resection. Overall morbidity rate was 6.2%, with no significant difference between right hemicolectomy and left hemicolectomy or sigmoidectomy. The length of hospital stay was 5 days. Conclusions: Single-incision laparoscopic colectomy is technically feasible and safe. This technique may be an alternative for current specialized port and instruments. Greater numbers and a randomized controlled trial will be necessary to access the true benefit of this approach.